Sometimes its nice to get away from the blogging world.One needs to take a break and not feel, I need to add a recipe, I need to keep my followers busy, etc etc. Though I had not planned to take a break from blogging while I was visiting my son in Montreal, it was a compulsory break. His computer was not working too well, it was just too slow. I tried uploading photos and it took forever. The first few days I missed blogging but then got busy and didn’t miss it that much. This time round hubby and I made frequent trips to the lovely vibrant and colourful Jean Talon Market. It was a good walk to and fro for both of us and they have such quaint little cafes and eateries within the market or surrounding the market. Shopping at the market is a delight… fruits, vegetables, herbs, plants, meat, fish, nuts, cheeses, wines etc etc.. the list is endless. We would want to buy all the fruits and vegetables available but had to hold ourselves back. Why?? Well who would carry so much? Remember we have to walk back home which is a good 20 -30 minutes. What we also enjoyed was sampling the fruits. The sellers would cut up the fruit into slices and put it in a plate for everyone to sample. This time we were lucky to enjoy fruits which we don’t get in Kenya readily – nectarines, apricots, peaches, cherries. Had plums too but must admit I love the ones that are grown in Kenya and Tanzania, they are much juicer, sweeter and nicer. So, as soon as we reached my dear son’s home, it was ‘mum you rest, you must be tired after the long flight’ (14 hrs in flight and countless hours at the airports!). However this resting bit didn’t last too long. By evening he was reminding me first use up this and that. My ‘lack of sleep’ head could not register much. In that list was brie cheese. He kept on reminding me to use it up before it dries up. A salad it was. I had wanted to prepare it for eons and the next day made the same salad again and made sandwiches to carry for our picnic. The brie cheese was springy soft, creamy with a subtle nutty flavour. Check out the recipe. Do you like to shop at the market or the shop for your fruits and vegetables? Put strawberries, oil, vinegar and honey in a blender. Process till you get a smooth sauce. Take the dressing out of the blender into a bowl. Divide the salad leaves into two parts. Put it on the dishes you are going to serve. Slice the pears and add it to the salad. Sprinkle the cashew nuts over it. Its not easy to get perfect slices of brie as its pretty soft. Try and cut into thin slices and add it to the salad. Drizzle the dressing over it and enjoy the salad. Add other vegetables like cucumber, sweet pepper etc if you like. I just wanted a very fruity salad with the brie. To eat the rind or not… its a personal choice. Taste a bit and if you like it, go ahead and have it. Wrap the left over brie really well with cling film otherwise it will dry up. It will be good for a couple of days. After that it will go bad or have a strong ammonia like taste. 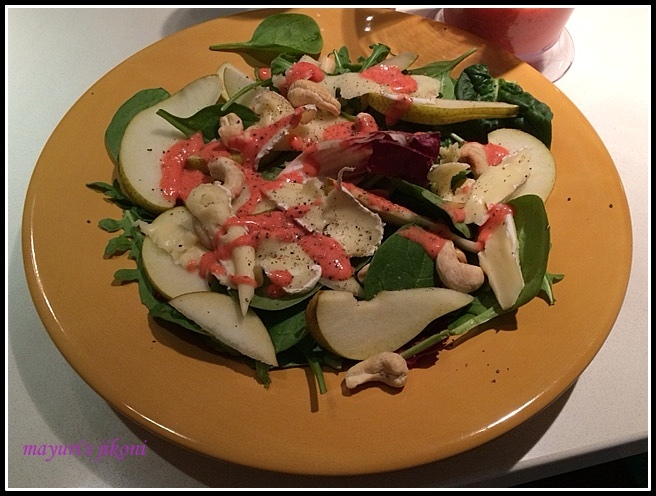 Pear and brie salad looks really nice and light. I do love going to the markets too sometimes for fruit and vegetable shopping. The salad looks really refreshing. Glad you enjoyed your trip abroad.